On June 1, Michael Nesmith and Micky Dolenz will go on the road as a duet with band playing the music of the Monkees and maybe a little more. Nesmith has previously said he was done playing with the Monkees during a couple of appearances, both live and via Skype, during the band's last tour. 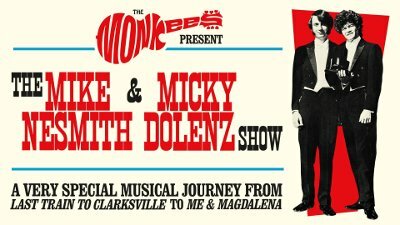 Now, he's back with bandmate Micky Dolenz with the new tour that is billed as "The Monkees Present". Heading to LA tomorrow for meeting and a hang with Mick. Have to cook up the M&M shows. Right now no clue what to do other than Monkees songs -- which are of course a lock. i didn't expect to go out again singing Monkees songs -- but here I am looking at dates with Mick for the month of June -- the beginning of Summer, I think -- dates are posted at most of the Monkees sites and here -- but the set list doesn't exist yet. M and I will sit around and sing try to find out what makes sense with the two of us -- maybe the occasional guest. As I write this I put on Chris Smither's "Live as I'll Ever Be" and its lifting me up into the skies of songs -- opening up settlements where we might perch and gaze out for miles and miles and sing and play the Music. If all goes as planned I think we will put together a fine show. I love singing with Mick -- this will be the first time an M&M show will be realized -- after all these years. As I say I suppose we will play the deep cuts from the Monkees catalog -- and songs M&I have written over the years -- and as we are blessed we will find the space that the great live players find over the years -- those deep and real places that are undeniable, that leave no question unanswered -- and to me that is a definition of Smithers concert and his magic acoustic guitar. So I am listening closely to him-- learning what I can. Anyway, I'm looking forward to the trip and to seeing Mick appear singing along beside me in the same room. One of my life's gifts and blessings.